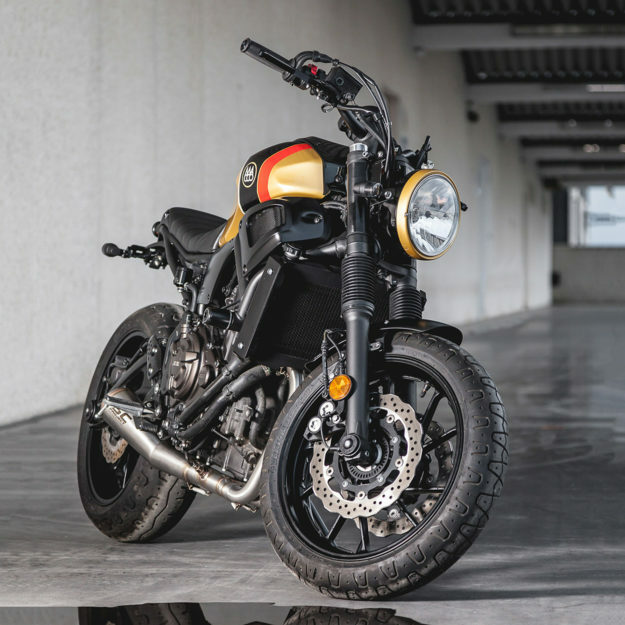 Most conversations about the Yamaha XSR700 revolve around its aesthetics. 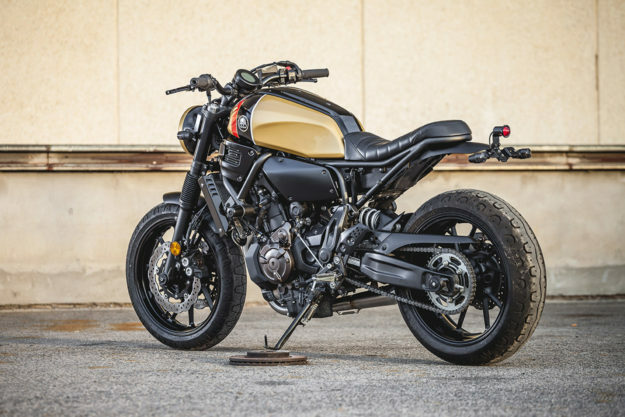 Many pundits can’t get along with its looks—but will still admit there’s a damn fine motorcycle hiding underneath it all. The 689cc inline twin is smooth and punchy, and it’s light on its feet. 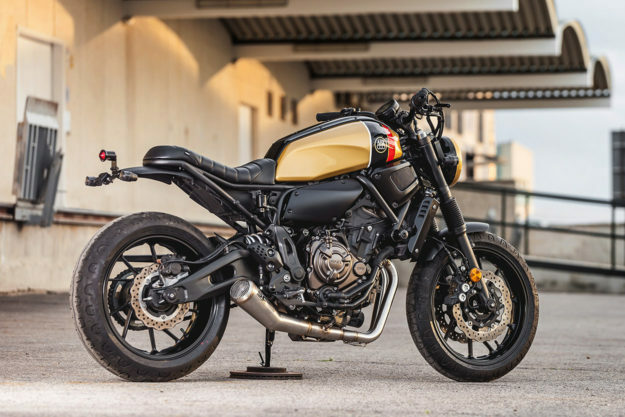 Plus it responds really well to customization; we were originally raked over the coals for loving the stock bike, but the custom XSR700s we’ve shown have mostly been met with praise. 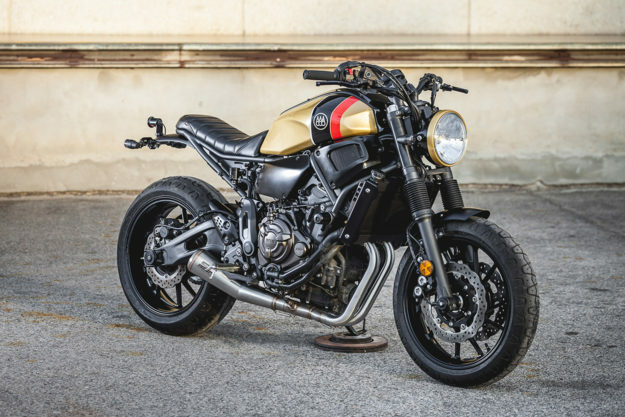 The owner of this XSR700 is a big fan—but saw the potential for more. 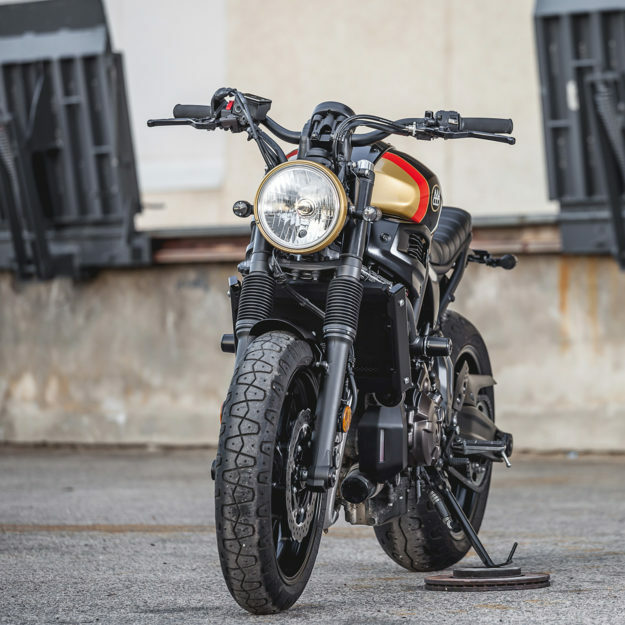 So he delivered the retro middleweight to Macco Motors’ workshop in the sunny Spanish city of Málaga, and let proprietors Jose and Tito loose on it. 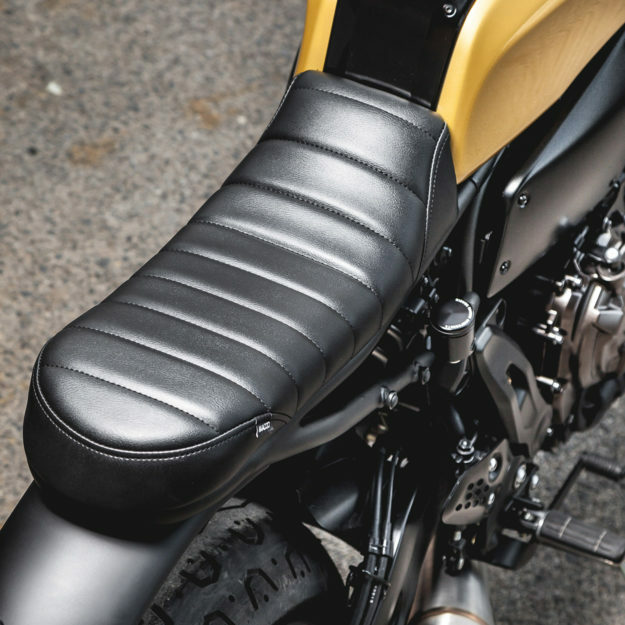 One of the client’s requests was a slightly lower seat—which the Macco boys saw as an opportunity to neaten up the XSR700’s subframe area. They lopped off most of the stock subframe and welded in a new one, devoid of superfluous brackets. There’s a lower, custom-made solo seat up top now, and the passenger peg brackets have been removed. Macco also added an abbreviated rear fender, complete with street legal running lights mounted around the license plate holder. The guys put a lot of energy into tidying up the under-seat area—right down to hand-shaping a new set of fiberglass side panels. They weren’t happy with the final finish on the fiberglass though, so they’ve used a bonding paste to apply a layer of vinyl. Up front, Macco dropped the forks by just over an inch, adding anodized alloy fork sleeves and rubber gaiters in the process. They then added a stout seven-inch headlight, mounting it (and new turn-signals) on hand-made brackets. 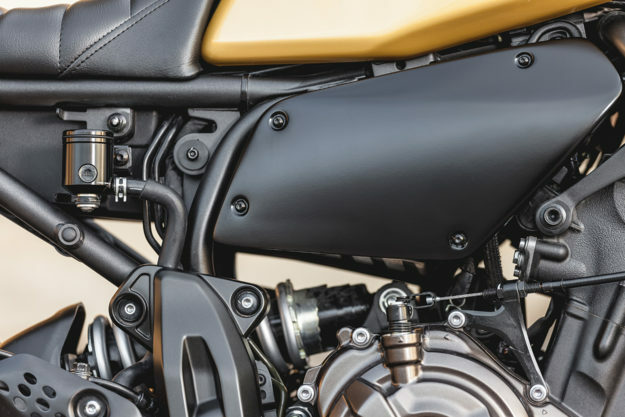 The XSR700’s stock speedo is a pretty good-looking unit, so it’s still there. The bars and levers were swapped for LSL units though, along with a pair of Avon grips. 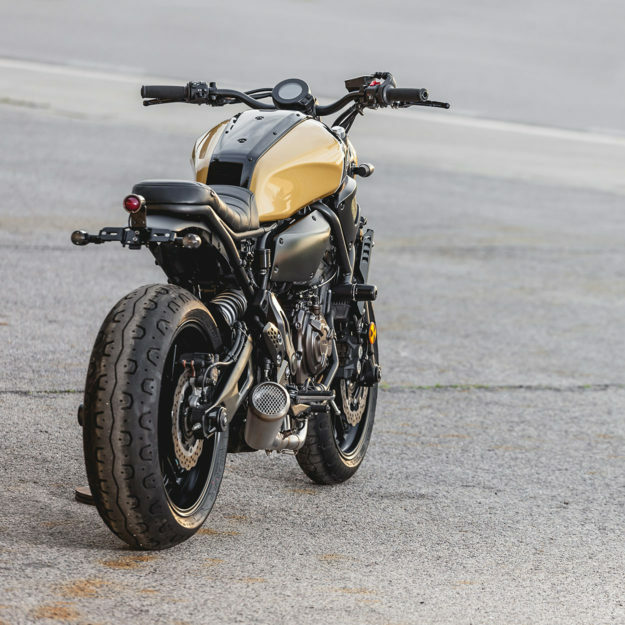 Rizoma supplied the front fender, rear reservoir and crash bobbins. Macco have fettled some finer details too—like adding new, better-looking radiator shrouds. 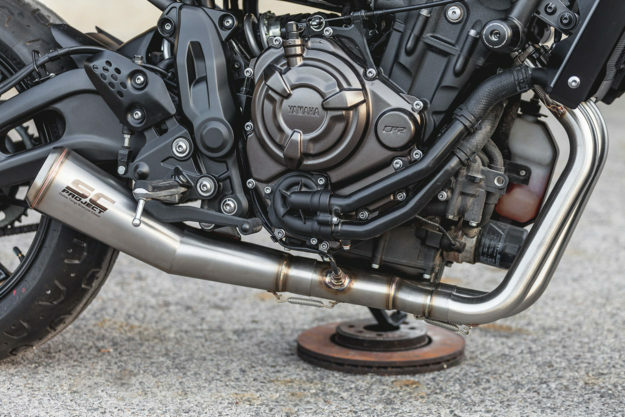 The tight exhaust system with its stubby end can is one of our favorite features on this build. 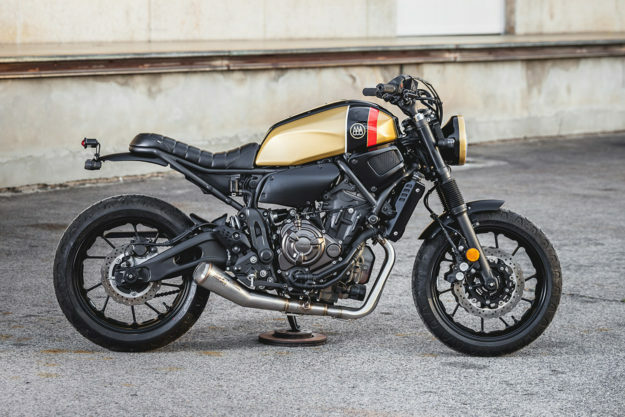 It’s from MotoGP suppliers SC Project, and it’s the first thing we’d buy if we got our hands on an XSR700. As for the gold livery: it might be a little outrageous for some, but Formula One historians may recognize the hue from the radical Arrows A2 car of 1979. That was the reference that Macco’s client gave them, and we reckon they’ve nailed it. Other bits were finished in satin black, to help mute the clutter of the modern componentry. Last on the list was the ever-contentious issue of tires. Macco threw a few options at their client, but ultimately he opted to stick to the Pirelli Phantom Sportscomp rubber that Yamaha’s engineers chose. It’s a refreshing sense of practicality, which is a hallmark of this build. Given that Macco have also eradicated much of the fussiness of the original design, there’s plenty here for XSR700 owners to chew on.